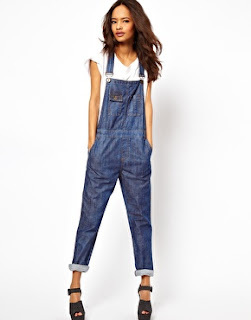 Avenue 57: Can grown women wear dungarees? 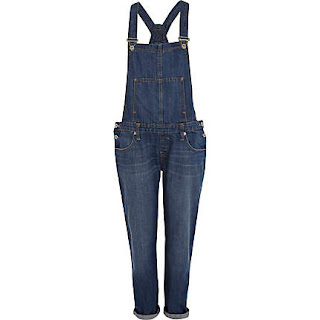 I've been chatting with some of my fellow fashion bloggers about dungarees. It all started last week when we were discussing them and how they are EVERYWHERE in the stores right now ... I thought it might be fun to do a blogger challenge (you know the sort of style collaboration where you each take 1 item and 'make it your own'). But then life got in the way and I didn't have the time to focus on this. However, one of us did - Poppy's Style - she hasn't yet put anything on her blog (yet) but we were very privileged to see a photo of her in her dungarees behind closed doors and man alive it split the camp. Some totally loathed the look (dungarees on a grown woman) and some liked the look .. some even went as far as to say they loved it! We created a virtual bench for us all to sit on and one by one we're filling up that bench with a 'no, I don't like them' opinion. I admire Joanna for continuing with her love of them despite a split camp! I can JUST about look at Tiffany Wendel in her dungarees but if you look at why it might work it's because she's covered up half of the dungarees with a blazer - so really she just looks cool in her boyfriend style jeans. I actually think she could make anything look good though. Where do you stand on the marmite item that is dungarees? How is it possible for a grown woman to make them look good? Mine are the ASOS ones - and crumbs now you've outed me I better get them on a blog post! I have bought some black taper leg ones from ASOS. I have yet to wear them (saving them for a weekend away next week!) but I love them, and even my husband likes them (I'm a month away from 40!) And yes Joanna - we want to see yours!!! Yes - maybe the black ones look a little more grown up. But on the other hand, I have a fairly quirky look anyway, so I wouldn't really describe myself as grown up! It may be that I can remember having a pair of denim ones circa 1990!!! I can too but think more late 70s when I was 7! I can see how the black ones/grey tweed can work but still it's one step from comfort zone! first reaction was NO WAY, but actually looking at the pics they all look great, especially the taper leg onea. i live the photos through Tiffany's artfully dirty mirror, very forgiving! Yes I can see how this style would work - be brave and show and tell over on avenue57.com - pretty please! Hard for me as my daughters wear them so I said no but Joanna does look good in them. I of course am far too old and wore them first time round! If I had daughters, and they were wearing something as statement at these then I'd avoid totally! 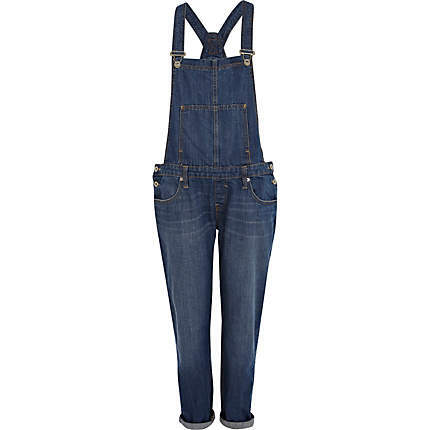 I do think grown women can wear dungarees, but they have to be styled properly. The last time I tried them I couldn't make them work. I applaud the ladies who can. (Can I add? Loathe the ones on Abby. They fit funny and the top looks like a baby bib). It's teh bib part that gets me every time as to why they really don't work - styled or not!! True! I admire those that wear what they want! I like them! Very Dexy's!! However, not sure they are very practical (always a strap down the toilet problem when I wore them as a child).